Belgian police have warned citizens not to use Facebook’s new Reactions, to protect their privacy. What for why would Belgian police do that? So lets find out the reason. The feature has been available since 2014, but recent warnings from Kelli Burns, the mass communication professor at the University of South Florida, have drawn attention to it. Whatsoever be the reason are you comfortable with someone listening to your conversations. I would again say if you were comfortable with people entering your privacy, you would easily allow your parents to listen what you talk. And if you really are comfortable with people listening to your conversations, you can surely stop reading. Belgian police say that the site is using them as a way of collecting information about people and deciding how best to advertise to them. Warning user to stop using. Professor Burns tested the feature, she discussed certain topics around the phone and then found that the site appeared to show relevant ads. The claim chimes with anecdotal reports online that the site appears to show ads for things that people have mentioned in passing. 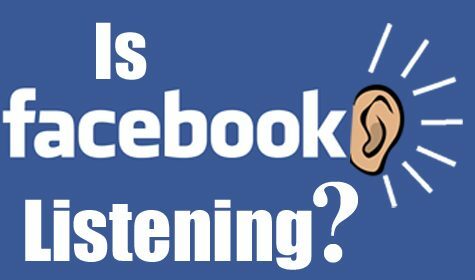 Facebook said that it does listen to audio and collect information from users – but that the two aren't combined, and that sounds heard around people aren't used to decide what appears in the app. But Finally Facebook agrees that it monitors your microphone to collect audio. Facebook says explicitly on its help pages that it doesn’t record conversations, but that it does use the audio to identify what is happening on the phone. The site promotes the feature as an easy way of identifying what you are listening to or watching, to make it easier and quicker to post about whatever’s going on. But if people really wanted to post such things people surely have the options to type in their status. Why do people have the need to let anyone enter their privacy? It's so clear facebook is having its own motive behind such actions and none of the users wants their privacy to be at risk. Turning off the microphone in a phone’s settings is relatively easy, and since it can be done at the level of the operating system, doing so will mean that Facebook can’t turn it on even if it wanted to. It’s done on an iPhone by heading to the app’s settings, clicking through to privacy and switching the slider for the microphone; on Android phones, head to settings and then privacy, and change the permissions that the Facebook app is given. Ethical Hackers Club Cares for your privacy and will keep you informed about the risks associated with your loved tech. So, Stay Safe - Stay Connected.